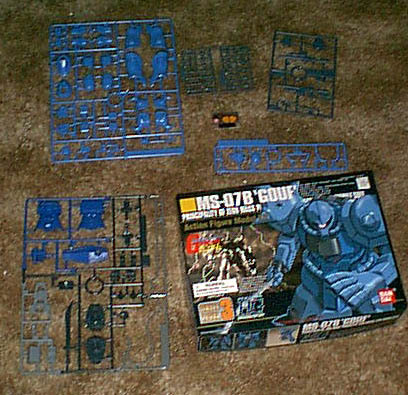 The MS-07B "Gouf" is a followon suit to the Zeon "Zaku" suits, which had been used since the beginning of the Mobile Suit Gundam series. It bears a family resemblance in the rounded shapes, spikes, and the like. 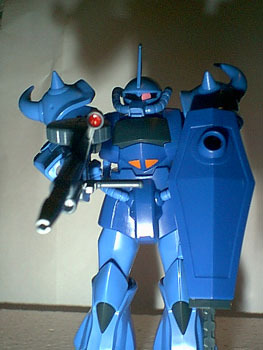 The kit is one of the "High Grade" series of Gundam kits. These have more parts and typically more articulation than the basic Gundam series of kits (which usually sell for around $5 less, but are the same scale, 1/144.) The same basic assembly style translates between the two sets, with snap-together plastic parts and poly caps in the areas that provide movement. Assembly was very - well, unremarkable. The fit of the parts are very good, and with care taken when removing them from the parts trees, you shouldn't have any gaps. You might want to use glue on one or two areas - the lower arms, and the arm "spikes" come to mind - but it's not really neccessary. I've gotten into the habit with these of using my hobby knife to 'shave' the ends of the poly pieces. It gets the very ends of the pivots just a hair smaller, and seems to help the fit tremendously. One thing you may want to do, whether you paint and weather the model or not, is highlight the panel lines. It is easy to do, and does enhance the look of the model. The panel lines themselves are rather heavy on this model, and makes a basic (though sloppy) technique very easy. Working quickly, you paint black into the panel lines, then wipe it off immediately. The surrounding plastic will remain blue, while the black stays in and shows the lines and vents. Alternately, get a black technical pen with a very fine tip, and just "draw" the lines in. 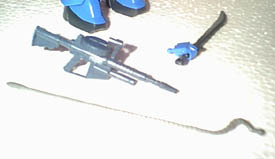 Having said all that, the weak point in this kit (to me) is the right hand, which is where the weapons are. (Admittedly there are cannons built into the fingers of the left hand, but you can't switch those out.) 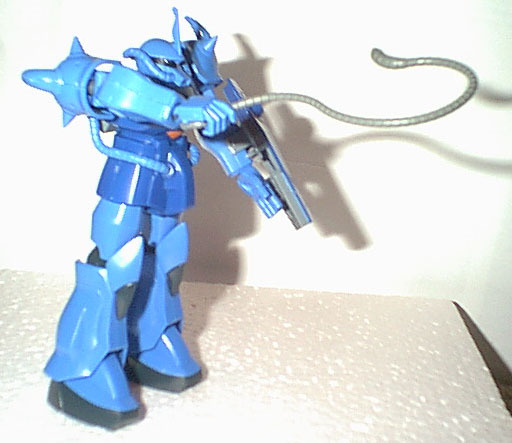 Contrasting it to its predecessor, the Zaku II, you only get two hands, but three (or four, depending on how you count it) weapons - two "heat rod" whips (one curved, one straight out,) a machine gun, and a sword (stored in the shield, which just clips on to the left arm - very securely, I must add!) You're only given two hands, though - one for the whips, which also must get "clipped" into the fitting just behind the hand, and one for the sword and gun. More hands would have been very nice, as prying the hand apart to fit the other heat rod, the sword, or the gun, is a pain and can lead to the hand breaking or at least not fitting as well. 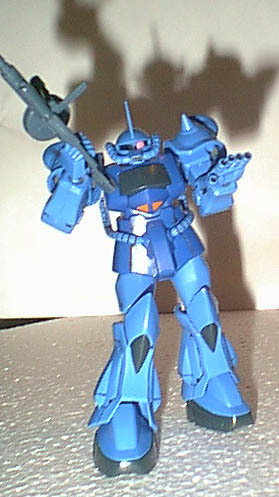 On the Zaku II I was comparing it to, you get another complete hand - the Heat Hawk axe fits in the left hand, and you get two hands for the right, one for the bazooka and one for the machine gun, which can be glued together and left permanently. 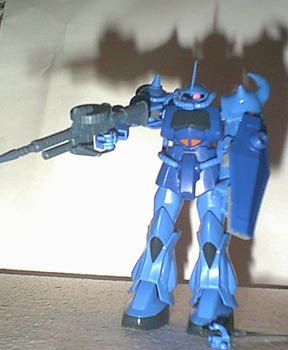 In addition, the heat rods on this kit (at least the curved one) are odd toit through the hand. The best method I've found was to just trap the rod in, fit the ball end into its fairing, then let it straighten itself out as you clip the hand back on. All in all, it's another nice kit from Bandai of unusual subject matter. I've said it before, and it's still true - it's a great way to take a break from the "usual" aircraft, ships, cars, or tanks that you may build already. It can also be a great way to spend time with your kids - instead of buying one of the Gundam toys, buy the kit and put it together with them, then let them play with the result. It gives you more 'quality time' (and a bigger end product) than just buying the figures. Recommended, with a bit taken off for the hand annoyance, to pretty much anyone.